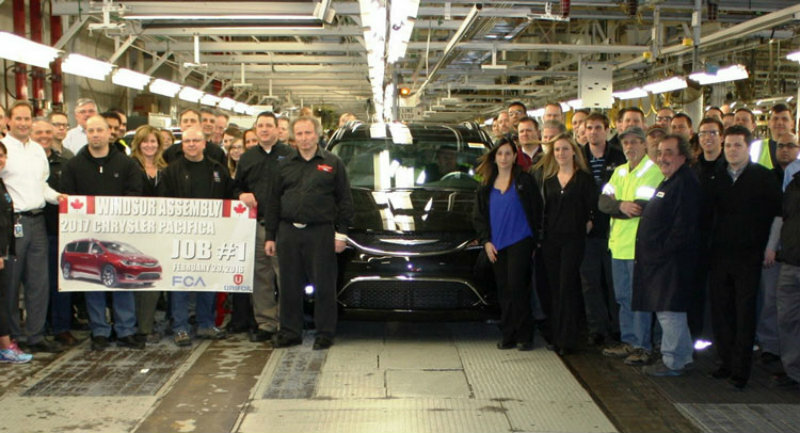 Production of the 2017 Chrysler Pacifica is underway at the Windsor Assembly Plant in Ontario and the first completed Pacifica has already rolled off the assembly line. The 4.4-million-square-feet factory was first built in 1928 and it was been pumping out minivans since 1983 while running three shifts. This factory was the first one in North America to be awarded the silver level designation in World Class Manufacturing (WCM), an award granted to factories that aims to reduce waste and injuries while improving production quality and efficiency. Chrysler’s 2017 Pacifica minivan will be offered with two powertrain options and 8 different trims. You will be able to choose from a 3.6-litre V-6 Pentastar engine paired with a 9-speed automatic transmission with a power output of 287 HP and 262 lb-ft of torque or a Hybrid Pentastar V6 engine paired with an electric motor and a 16 kWh battery pack. The hybrid version is expected to go into production later this year so the first one off the line is the non-hybrid model. Prices will range from $45,740 (Pacifica Touring-L) to $54,740 (Pacifica Limited) and the MSRP does not include the $1,745 destination charge. You can expected the first units to appear on showroom floors this spring. Not bad pricing which is right up their with pricing of the Infiniti QX60 which have sort of served this market, the demographics sure show that.